The world’s first fuel cell powered passenger ship is getting ready. Zemships (Zero Emission Ships) are coming with fuel cells to propel ships as a zero emission solution. Reason ? Environmentalists fear that emissions of sulphur dioxide and nitrous oxide from ships are expected to be more than land based emissions in the European Union by 2020. Zemships is an EU- Life supported project with an objective to develop and operate a fuel cell powered passenger ship with a hydrogen fueling station. The fuel cell powered Zemship in the range of 300 to 600 kW can accommodate up to 100 passengers. The only emission from Zemship is going to be water vapour. The fuel cell powered Zemship will run as a passenger ship in Alster lake, Hamburg for two years from summer 2008 on regular services to collect data for further development of the fuel cell technology to apply in bigger ships. Fuel cell powered ship is expected to have an efficiency level of 50 per cent about twice that of the present diesel-electric propulsion system used in the ships. Zemship is also being designed to have low noise level as the Alster lake in the Hamburg city is a ecologically sensitive area. Zemship project was started in November 2006 and is scheduled for completion in April 2010. Germanischer Lloyd: to carryout hull survey and certify the ship including vital internal systems like hydrogen plant and the propulsion system. Also carry out a comprehensive safety analysis to prevent malfunctions and to maintain reliable and safe operations. 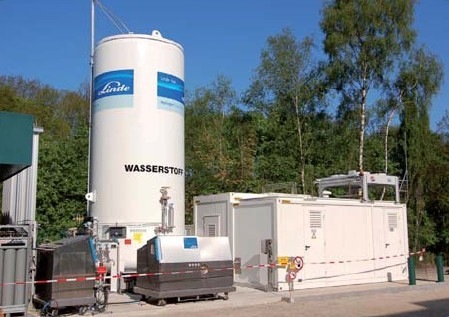 The Linde-Group: to build and operate the Zemships hydrogen filling station. Proton Motor: to provide complete hybrid electric fuel cell propulsion system of the ship. Proton Motor has completed manufacturing of fuel cell stacks. The Linde Group has completed construction work at hydrogen fueling station. Further the first Zemships Conference is going to be held on October 23 at Hamburg as part of the International H2EXPO Fair. 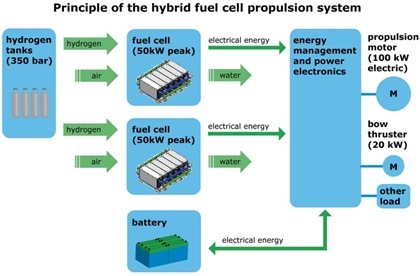 Here is the Principle of the Hybrid Fuel Cell Propulsion System. Here is the Zemship model. All the above images are from Zemships. More information on Zemships is available here. Here is an interesting video clip of swans in Alster Lake. 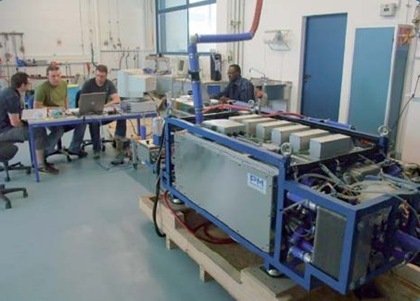 Here is a video clip on the working of hydrogen fuel cell car. Zemship now named as FCS Alsterwasser has commenced her maiden voyage on August 29. The Fuel Cell Ship will continue her trials till November. Read more from Triplepundit. Also read press release from Proton Motor.